Important Information: Please read your ad carefully the first day it appears. In case of an inadvertent error, please notify us prior to the deadline listed. We will not be responsible for more than 1 incorrect insertion, or for more than the extent of the ad rendered valueless by such errors. Advertiser assumes responsibility for all statements, names and content of an ad, and assumes responsibility for any claims against the INI USA. All advertising is subject to publishers approval. The publisher reserves the right to accept or reject any or all copy, and to insert above the copy the word advertisement. All ads accepted are subject to credit approval. All ads must conform to INI USA style and are restricted to their proper classifications. Some classified categories require advance payment. These classifications are denoted with an asterisk *. Auctions HUGE AUCTION: Farm, Ranch, Construction Equipment, Misc. ToolsSATURDAY, APRIL 5, 9AM Will Begin Accepting Consignments 3-31-14 Frank E Land, Auctioneerwww.landauctionservice.comLee Civic Center 11831 Bayshore Rd. Enter at Gate 2 Old Bayshore Rd N. Ft. Myers, FL 333917 (239) 936-4121AB2084/AU2814 Need a few more bucks to purchase something deer? Pick up some extra bucks when you sell your used items in the classifeids. Employment Full Time Commissary Assistant Moore Haven, FL Keefe Group, a leader in the prison supply industry. Is hiring a fulltime Commissary Assistant to assist the Commissary Manager or KCN Management in providing commissary operations and services to assigned location, including ordering, receiving, stocking, processing inmate orders, and driving regional van. Must have valid ID and pass security/drug clearance. Please apply online at:www.centricgroup .comEOE M/F/DV Central County Water Control District is now accepting applications for a TRACTOR W/BATWING OPERATOR Must have a Class B CDL, clean driving record, high school diploma. Must be able to keep written records. Job duties vary with seasons, heavy equipment knowledge a plus. Drug screening required before hiring. Apply in person at 475 S. Cabbage Palm Street, Clewiston. This is a equal opportunity employer and a drug free workplace. DRIVERS: $5,000 Sign-On Bonus! Great Pay! Consistent Freight, Great Miles on this Regional Account. Werner Enterprises: 1-855-517-2488 7 Serving the communities south of Lake Okeechobee March 20, 2014 Your next job could be in todays classifieds. Did you look for it? 2 Serving the communities south of Lake Okeechobee May 27, 2010 11 Serving the communities south of Lake Okeechobee March 20, 2014 Free Foreclosure Prevention AssistanceDebthelper, an HUD approved counseling agency, is offering free foreclosure prevention assistance. Debthelper is found inside of United Way/Goodwills Industry, located at 969 W. Sugarland Highway in Clewiston, and is open on Mondays from 9 a.m. to 1 p.m. Please contact Maria Torres at 863-301-3180 or 863-983-2774 for an appointment.Health Fair/ Outreach Festival Elite Heathcare Staff is proud to announce the upcoming Health Fair/Outreach Festival, which will be held on March 29 from 11 a.m. to 4 p.m. at Greater Friendship Baptist Church, located at 901 Della Tobias Avenue in Clewiston. Elite is under the care of Dr. Hans M. Louis-Charles, MD and Angela Engram, A.R.N.P. They are inviting everyone in the community and surrounding areas to come out and enjoy the festivities, including food, drinks, health screenings and carnival activities for the kids to enjoy. All festivities are free of charge. The carnival festivities are being sponsored by the people, local business and organizations of the community. Anyone interested in becoming a sponsor or anyone who may have questions and/or concerns should contact April Minikwu at 863-8050317 (of ce) or 561-449-1009 (cell).Garden Club Field TripThe Clewiston Garden Club will be going on a eld trip to the Springtime Nursery on Thursday, March 20. The club will meet at the Clewiston Museum at 9:30 a.m. Light refreshments will be provided while waiting for all members to arrive. After the eld trip, the club will be going to Forrey Grill in LaBelle for lunch.Presentation on 7 AprilThe Loxahatchee Chapter of the Florida Trail Association will present a program on "Palm Beach County's Trail Connections." Highlighting the connections between the county parks and natural areas. The presentation will be at the Nature Center at Okeeheelee County Park, at 7 p.m., on April 7. Okeeheelee County Park is located on Forest Hill Blvd., west of Jog road.Spring BreakfastEvangel Ladies Spring Breakfast will be Saturday, March 29 from 8 a.m. to 11 a.m. Serving sausage, eggs, grits, biscuits, sausage gravy and hashbrown casserole. Come and enjoy a hearty breakfast and shop our baked goods. Take out is available. Suggested donation is $6 for adults and $3 for children. 350 South Berner Road, Clewiston.Free Frozen Movie NightJoin us at First United Methodist Church on Friday, March 21, 6 p.m. for a free showing of Disney's "Frozen." There will be food, door prizes, and lots of good fellowship... and there is no charge! We preview all movies to assure family appropriateness before we show them! Come join us! COMMUNITY NEWS AND INFORMATION Lady Tigers SoftballPlease come out and support the Lady Tigers! Please contact Melissa Whitehead Carter at 863228-0479 with any questions or concerns. Lady Tigers Softball Schedule March 20: vs Lincoln Park (district game), 5 p.m./7 p.m., away. March 24: vs Bishop Verot, 5 p.m./7 p.m., home game. March 28: vs Moore Haven, 5 p.m./7 p.m., home game. April 1: vs Lake Placid, 5:30 p.m./7:30 p.m., home game. April 2: Pahokee (district game), 4:30 p.m., away. April 4: vs LaBelle, 5 p.m./7 p.m., away. April 8: vs King's Academy, 5 p.m., away. April 10: vs Glades Day, 3:30 p.m./5:30 p.m., away. April 14 to 17: districts at Clewiston.Clewiston Students on Deans ListHendry/Glades Center Students Named to 2013 Fall Dean's List. The Edison State College Hendry/Glades Center announces the 2013 Fall Dean's List. Edison State College students are named to the Fall Dean's List for completing 12 or more credits that semester with a grade of "C" or higher and a grade point average of 3.5 or above. Alva students named to the 2013 Fall Dean's List are Ryan Bodiot, Alyssa Challender, Tiffany Daley, Kellyann Erskin, Kaitlyn Johnson, Kailee Keeling, Janetta Mullins, and Megan Urban. Clewiston students named to the 2013 Fall Dean's List are Albert Dorelien, Kaitlin John, DeLana Lara, Izai Sanchez, and Cory Wilcox. LaBelle students named to the 2013 Fall Dean's List are Alma Benitez, Andrew Benkert, Trisha Bennett, Sherry Blanset, GianCarlos Castano, Austin English, Jessica Escamilla, Laura Escamilla, Michael Gonzalez, Elaine Guerrero, Mariel Juarez, Cesareo Leos, Ramon Leyva, Eunice Marquez, Angela Martinez, Joseph McDaniel, Amelia Molina, Mark Perkins, Yesenia Resendiz, Yisvi Rodriguez, Octavio Sandoval, Jiesha Stephens, Roberta Thomas, Brandon Toulis, Danielle Tritt, Elizabeth Walker, and Jessica Whitman. Moore Haven students named to the 2013 Fall Dean's List are Kelli Atkinson and Jason Queen.Homeschool Support Group MeetingH.E.R.E. (Home Educators Reaching for Excellence) meets on the second Saturday of every month at the Clewiston Library at 9 a.m. For more information, call Melanie Rudd at 863-228-7840. SCHOOL BRIEFS BY ELECTA WADDELL Clewiston Chamber of CommerceWould you get locked up to support the Clewiston Chamber of Commerce? This unique fundraiser allows participants to "serve time" in order to raise money to support the Chamber's Sugarland Tours. Citizens apply for a "warrant" to have an individual "arrested" by an of cer of the Chamber. The arresting of cer will have fun and creative arrest warrants, complete with quirky aliases and hilarious crimes. Out tted in black and white striped prison garb, those charged with a ctitious crime will be tasked with a "bail" amount they are required to raise before being released. Each jailed participant will serve his or her "time" at the makeshift jail facilities which will be constructed at the Clewiston Sugar Festival Chamber tent on April 12. They will be hauled off to jail from 12 p.m. to 5 p.m. when the suspects will stand in front of a judge who will announce the litany of charges: too many strokes on the golf course, overzealous Florida Gator fan, being addicted to playing Candy Crush Saga and more. Local business professionals and high ranking of cials are expected to be some of the jailed. Money raised during the event goes to support the services and vital upgrades for Sugarland Tours. 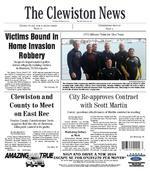 "We are bringing in individuals who are unfamiliar with Clewiston and taking them on tours that highlight all that is great about America's Sweetest Town," says the Chamber Board of Directors President Belinda Smith. Sugarland Tours is a 4.5-hour heritage and agricultural tour that runs from October to March and sees over 1,400 riders, most of which are snowbirds and individuals traveling from both coasts, attend. "These tours are a vital resource for the Chamber, as well as for Hendry County Tourism," say Smith. You can purchase warrants for $20 to $100 now at the Chamber of Commerce or by calling 863-983-7979. Follow the Clewiston Chamber of Commerce on Facebook to see all the mug shots of our jail birds! Jail and Bail for a Good Cause SUBMITTED PHOTOSCentral Spelling BeePictured are the spelling bee participants at Central Elementary School. Congratulations to all! Winners: Caroline McCray ( rst place), Joana Pardes (second place) and Tyqwon Mills (alternate).